They are the first people you meet when you walk into a restaurant. Ideally, they are trained to smile and greet diners as they enter, then seat them at a table while simultaneously informing them about the list of specials, which they probably just memorized moments ago. Then they take your order, making sure you get it fast and hot, while refilling your glasses of water and Shiraz throughout your meal. If you welcome it, they will indulge in some friendly banter with you, exchanging anecdotes or trading opinions on current events. When all is done, they usher you out with a smile and a “come see us again,” and hopefully you have rewarded them with a generous tip on top of the usual 10 percent. 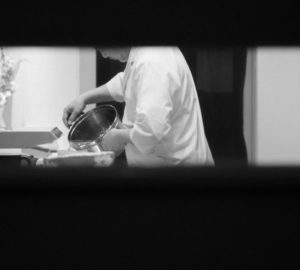 Oftentimes, what separates an excellent restaurant from a good one is stellar service. An army of well-trained, charming, and savvy waiters can often make or break your dining experience. Mediocre food can taste 10 times better with the aid of efficient service with a smile. 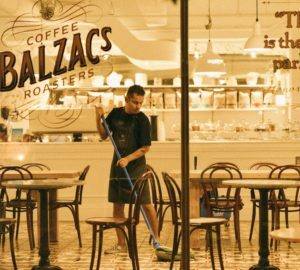 Surprisingly, this daunting responsibility rests on the shoulders of the front of the house staff or waiters—a job with minimal pay that entails notoriously erratic hours. 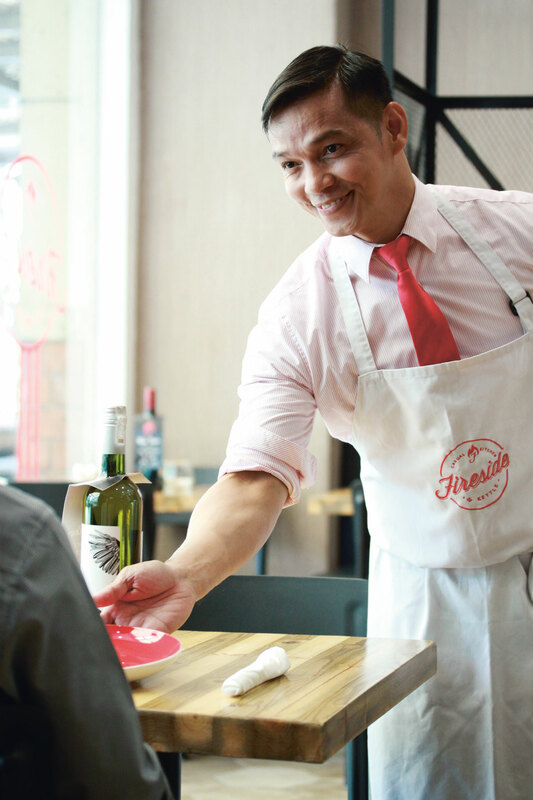 It’s a job that is often perceived as entry-level, but not for Cibo server Gerard Castilla, 31. After 10 years at the popular Italian casual dining chain, he still sees himself as a newbie, thankful for the training he received from Cibo’s veteran waiters. Some may wonder why the BS Mechanical Technology graduate opted to enter the back-breaking service industry. “I have three brothers and all of them were waiters before,” Castilla shares. 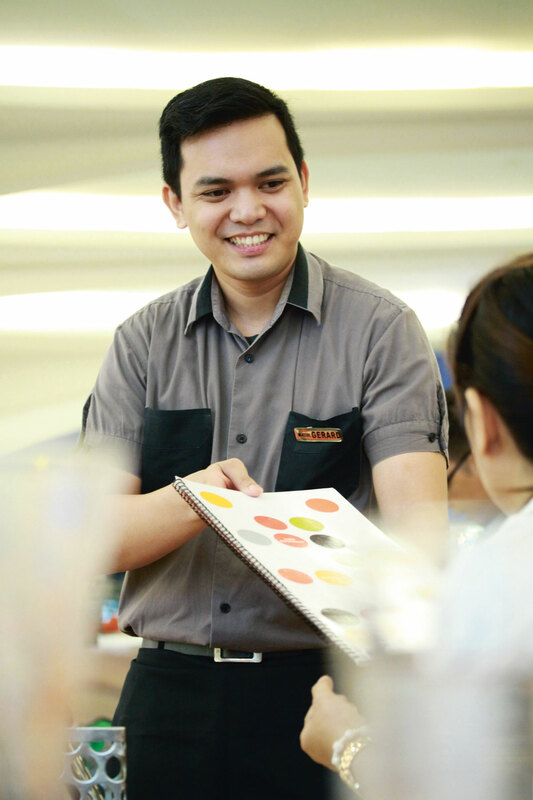 “Nakita ko na happy naman sila sa pagiging waiter, so I thought that’s what I should do also.” It is a job that he learned to do well and diligently, having been awarded Employee of the Year a couple of times over as well as earning recognition for his perfect attendance. “In this industry, you really need to be hardworking to be noticed,” the family man attests. “Minsan iniisip ko, ‘What if mag-call center na lang ako?’ At least nakaupo lang ako. Pero hindi rin. 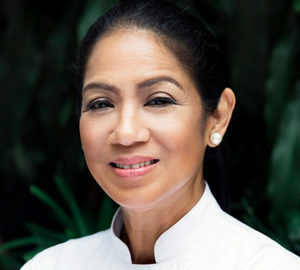 Masaya pa ako sa Cibo,” says Castilla. It’s a quality that 22-year-old Estephanie “Steph” Velasco clearly possesses. She admits that she freely accepts whatever shift she is given. 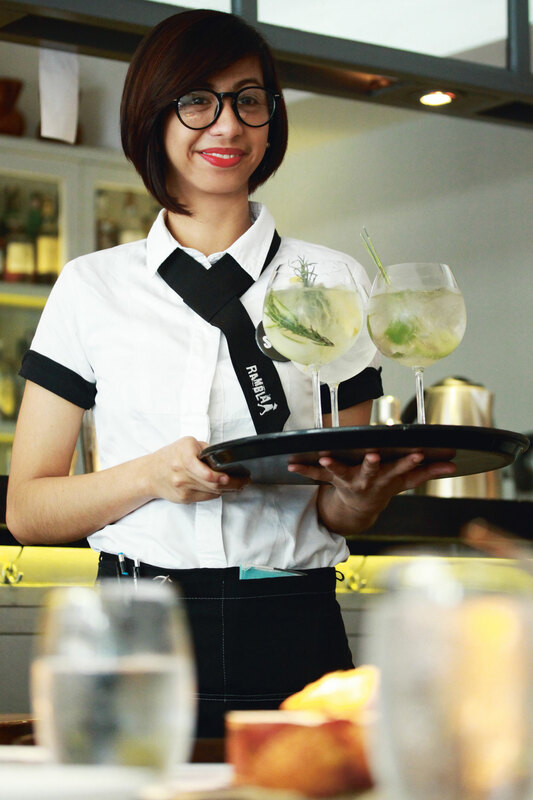 After only two years working at the trendy tapas bar Rambla, she has already climbed the ranks from server to supervisor. Typically shy and soft-spoken, she has learned to “come out of her shell” to be effective in her chosen field. “Hindi talaga ako ma-sosyal,” Velasco candidly reveals. After graduating with a degree in HRM, she initially wanted to work in the kitchen. But, perhaps due to her very current, quirky look, her on-the-job training landed her in the front of the house, firmly establishing her fate at the Rockwell restaurant. For others, though, the choice is more natural. Gio Hernandez, restaurant manager at the fast-expanding Kettle and Fireside restaurants, dove into waiting at a fast food chain as a working student in college. “I like meeting new people,” he admits. “Pati ’yung mga challenges sa araw-araw na pagpapatakbo ng restaurant, nae-enjoy ko.” In the 12 years since his first interview with his boss, Meat Plus’ Bambi Meer, he has risen from server to restaurant manager. Now, he is training the opening crew of Kettle and Fireside’s newly launched branches. Oftentimes, people treat the waitstaff indifferently, when in fact, they’re the ones they should befriend to guarantee an eating experience like no other. The normally reserved Velasco is an open book when it comes to her gripes about customers as well. She’s been waiting tables for a relatively short time (her first job was at Rambla), and she has yet to develop a thick hide when it comes to dealing with difficult customers. “Minsan, nakakainis talaga ’yung mga demanding customers,” the greenhorn admits. “Kaka-order pa lang nila, gusto nila nandiyan na agad ’yung pagkain. Hindi naman kami fast food, di ba?” Good thing, she admits, that she gets along with her workmates at Rambla. It’s the good working relationships that get her through the rough days and long hours. Castilla admits, though, that he does not see himself getting old in this industry. He recognizes the possibility of starting a small business in 10 years, or maybe working abroad. “I have family in Canada so that’s always an option,” he ponders. With the growing needs of his young family, he feels that he needs to start earning more. More than the tip, it’s respect that we need to pay the hardworking waitstaff—the same respect they give customers the moment they enter the restaurant doors. The youthful Velasco also has dreams beyond waiting tables, something that she admits she learned early on from the mistakes of an older sibling. “Pasaway kasi ’yung kapatid ko,” she quips. “That’s why I told myself, ayaw ko maging ganoon.” In 10 years, she’s hoping to have opened her own restaurant with her earnings. Waiters are expected to smile through harsh tirades and swallow snarky comebacks. The local restaurant industry prides itself on submissive and patient waitstaff that are famously tolerant of a demanding and spoiled dining market. It is a culture that takes hospitality seriously, and the expectations are oftentimes irrationally high. So, when given the chance, we wonder what our waiters are thinking behind their plastered smiles. “Kailangan din namin magpahinga,” Castilla relays, pertaining to those diners who come late and stay on until the kitchen has closed and everyone else has gone. “I’m not a machine!” Velasco says with a laugh. Yes, they’re people too, lest the dining public forgets. Oftentimes, people treat the waitstaff indifferently, when in fact, they’re the ones they should befriend to guarantee an eating experience like no other. More than the tip, it’s respect that we need to pay the hardworking waitstaff—the same respect they give customers the moment they enter the restaurant doors.